Mi quang won't leave The Temple Club's menu. There is only one dish that Geoffrey Deetz said he won't ever take off The Temple Club's menu: mi quang. 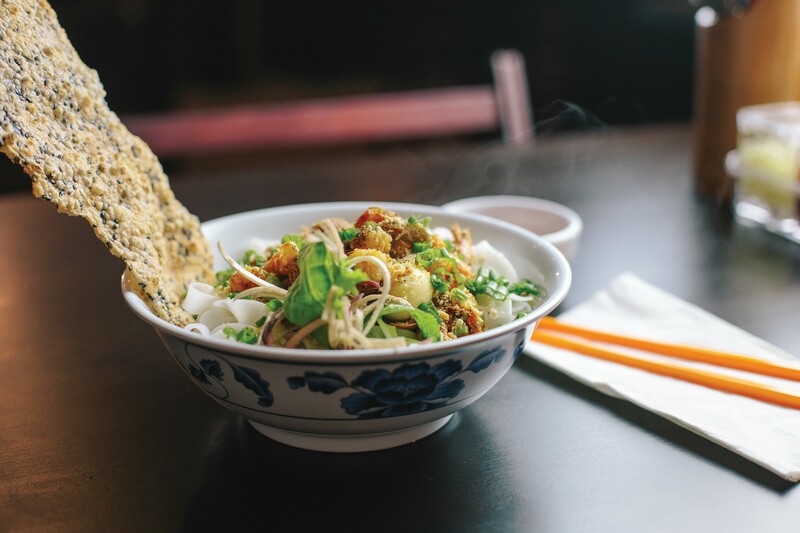 The noodle dish comes from Hoi An, Vietnam, a tourist favorite with a fairy tale-like old town. It's also where his wife, Quynh Nhu, is from, and mi quang is her favorite dish. Given that Deetz just moved Nhu and their two kids from Vietnam to Oakland, he couldn't open a Vietnamese restaurant without talking up mi quang. Back in the '80s and '90s, Deetz was a major player in the East Bay restaurant scene. He opened a slew of restaurants as eclectic as Spettro (Italian), Gold Coast Oyster Bar (Cajun), and Dragonfly Teahouse (Mexican-Vietnamese). Along the way, he found a mentor in the founder of Oakland's Pho 84 and developed a deep love for Vietnamese food. In 2000, he took the plunge and moved to Ho Chi Minh City. He stayed in Vietnam for 16 years, opening more than 20 restaurants, cooking on television, and volunteering at culinary schools. The Temple Club's mi quang tastes far more similar to my first experience of the dish in Hoi An than other versions I've tried in Oakland. It's drier, as it's supposed to be, with the wide rice noodles served in a shallow pool of sauce tinted orange with annatto oil. There's a bounty of head-on shrimp, tender pork, crushed peanuts, and herbs as well, with a toasted sesame cracker resting on top. Garlicky fish sauce is served on the side for a final splash of flavor. Deetz changes his menu as often as every day, depending on what he spots at the market and what dishes he feels like sharing. While not necessarily part of his overall vision, his pho bo chua is usually on the menu as well. With corned beef brisket, it's obviously not a traditional Vietnamese noodle soup, but he won an episode of the Food Network's Cooks vs. Cons with the dish and it deserves the praise. The saltiness of the beef worked beautifully with the earthy, somewhat tangy, and umami-packed broth. 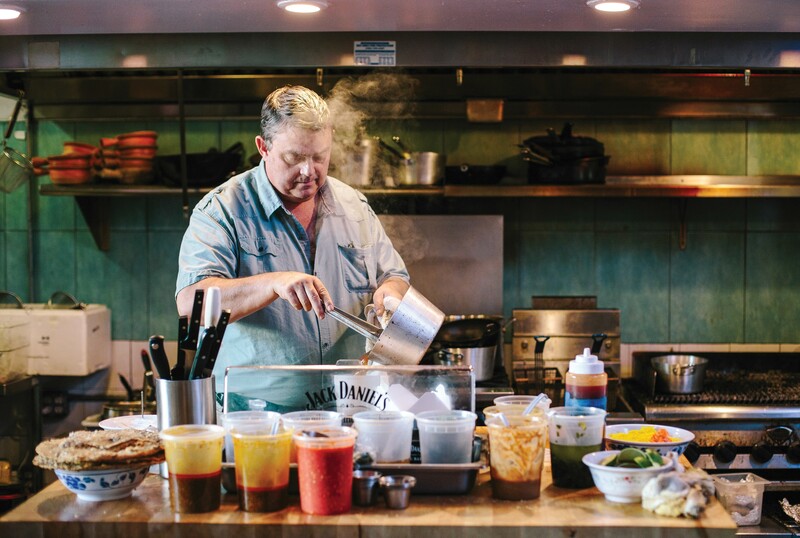 Chef-owner Geoffrey Deetz is cooking the food he loves most. But let's get back to the traditional dishes. On one night, he prepared heo kho dua cai chua, a little-known peasant dish from Hoi An with a heavy Chinese influence. Served in a clay pot, it featured perfectly stewed pork with pickled mustard greens and aromatics — an explosively flavorful, salty-sour dish that absolutely benefitted from its side of rice. I also tried xao lan chay, a pumpkin coconut curry with eggplant, glass noodles, and multiple kinds of mushrooms. It's a mild but lovely curry — especially considering it's vegan, as are all of The Temple Club's vegetarian options — though certainly not something I expected to find at a Vietnamese restaurant. Deetz explained its Mekong origins as a humble dish typically featuring seafood or frog that eventually migrated to the big cities. There, chefs made it sweeter and richer by adding coconut milk. I loved the goi ca mui ne, a wrap-it-yourself spring roll appetizer with rockfish ceviche, herbs, sliced pineapple, and a preserved fish-sesame sauce. Part of me wished I could have tasted the fish more, but there was no arguing with how wonderful each element worked together — nor that powerful dipping sauce. In general, The Temple Club's sauces always impressed and showcased Deetz's attention to detail as nearly every dish came with its own distinct accompaniment. Goi cuon nem chua, a somewhat standard-looking spring roll appetizer, was particularly delicious thanks to its pungent pork liver sauce. I did wish the starring ingredient, the grilled sour pork and pig ear sausage, offered a little more smoke from the grill as well as that promised sourness, though. That same sauce came with the bun thit nuong, the common pork vermicelli bowl. Only this version was Hoi An-style and packed with more herbs and pickled vegetables, plus succulent grilled pork fragrant with lemongrass. It's easy to go on, so I will. I thoroughly enjoyed the goi tai heo, a fresh and vibrant salad with banana flower and gelatinous poached pig ears. The canh ga chien nuoc mam, fried chicken wings with fish sauce, delivered sweet-salty-sticky skin and juicy meat. And the tom chien com, a simple appetizer of fried butterflied shrimp coated in rice flakes, felt impossibly light. I only have one real qualm, and it's the service. Though totally friendly and hardworking, I hoped for a little more finesse and knowledge on the floor. Deetz is making such intricate food that, for many, is likely to be new and interesting. The overall experience would be much stronger if servers instructed diners how to eat unfamiliar dishes — for example, if a side sauce is for dipping or pouring — and generally seemed less frazzled. This, combined with the aforementioned tiny kitchen, means things can get a little backed up if the place is packed. Deetz acknowledges this, though. With the staffing trouble many local restaurants are having right now, he said he's having a harder time than he expected recruiting experienced servers to East Oakland. Still, he's not letting it slow him down too much. Looking ahead, Deetz is applying for a liquor license and plans to launch more themed, one-off dinners that focus on a single dish. The first one — an evening devoted to tamarind crab — took place earlier this week. Hours: Tue. 5–10 p.m., Wed.–Thu. noon–3 p.m., 5–10 p.m., Sat. noon–10 p.m.